The Chevy Corvette is a pretty cool car, of course. But America’s sports car isn’t collected with such fervor as, say, just about any Ferrari, right? Well, perhaps not… but rare examples of the breed are gaining ground in the collector car market. The 1967 Chevy Corvette L88 seen above sold at Barrett-Jackson for a somewhat staggering $3.5 million (plus an additional 10 percent in fees). Best we can tell, this is a new record for a Corvette at auction, with a ’67 L88 convertible selling in late 2013 for $3.2 million holding that title before. It’s certainly a beautiful car, in a red on red color combination that is thought to exist only on this car. All told, Chevrolet sold just 20 L88 Corvettes in 1967, meaning this is an extremely rare machine. Check it out in our high-res image gallery above, and be sure to watch the video below showing the car’s time on the auction block. The 1967 L88 is extremely rare, 20 were produced. 20 of the most desirable Corvettes ever built. The true intent of the L88 was all-out performance on the racetrack. L88s were delivered without fan shrouds, they did not have chokes and were a bear to keep running until they came up to operating temperature, there was no radio and no heater. The L88 with 12.5:1 compression, hi-lift cam, 850cfm 4 barrel carburetor and aluminum heads was intentionally under-rated by GM at 430hp. Stock, as delivered L88s actually have been dyno-tested at 560hp. This vehicle is the only known 1967 red/red L88 produced, it has GM documentation in the form of a legible Tank Sheet (Order Copy) that has been validated by the GM/NCRS Document Validation Service. A L88 427 HD, M22 4-speed, J56 heavy duty brakes, J50 power brakes, F41 suspension, K66 transistor ignition, G81 4.56 posi-traction and shoulder harness. This is the only 1967 L88 to have attained an NCRS 98.2 Regional Top Flight 2001, 98.4 National Top Flight 2001, a Regional Performance Verification Award and the Ultimate award for Corvette restoration or preservation the NCRS Duntov Mark of Excellence Award 2001. Equipped just as the documentation indicates, this L88 is the best of the best. This entry was posted in Car Art - Automotive Art of Danny Whitfield and tagged 1967 Chevrolet Corvette L88 sells for $3.85 million, 1967 corvette 427, amazing cars, art for sale, art prints, artwork, automotive art, automotive transportation, Barrett-Jackson Auction, canvas, car art, Car Art - Automotive Art of Danny Whitfield, Chevrolet, contemporary paintings, cool cars, Corvette, Danny Whitfield, muscle car, prints. NEW 13-14 Mustang Widebody Kit available from Bangastang $4,500 Contact us for special pricing here! We have the 2013-2014 Mustang Widebody Kit that will take your Stang to another plateau. The Mustang Wide-body Kit has taken the Mustang styling scene by storm and there is good reason.Late model Mustang owners have longed for new Mustang accessories that are out of the box and not rehashed products from years gone by. Many of the Mustang parts and Mustang accessories that we see today are only copies of accessories from years ago. How many times have you seen the same style of Mustang Window Scoop on Mustangs from different generations? It doesn’t take much effort to repeat the same design. With twin turbo systems and superchargers late model Mustangs are putting down 750 to 1,000 RWHP which puts them in the BEAST category. With having a beast you must be able to tame the beast which involves suspension and TRACTION. With the Widebody kit comes wider front and rear fenders which allow for larger wheels and tires. How much larger? For the front fenders you can run a 285/30/20 tire. With the widened rear quarter panels you can run a 345/30/20 tire. Wider tires means more rubber on the ground and better traction. With 750-1,000 RWHP traction is vital to making the beast move. A carbon fiber Front Splitter and Rear Diffuser also comes with the Widebody Kit, both of these parts are functional. The Front Splitter increases downforce for more stability at higher speeds. The carbon fiber Rear Diffuser reduces air drag for improved aerodynamics. The quality of the carbon fiber is excellent. The Widebody Kit is not for your “Do it Yourself” home project we recommend finding a auto body shop that is experienced in fiberglass for the installation. The Widebody Kit comes with a gelcoat finish that requires prepping before installation. Rather your Mustang is a street car, show car or track car the Widebody Kit is something to consider. Price at $4,500 we’re offering a special discount if you place your order over the phone. If you’re looking to upgrade the performance and styling of your 2013-2014 Stang then Check out the 2013-2014 Mustang Widebody Kit here! 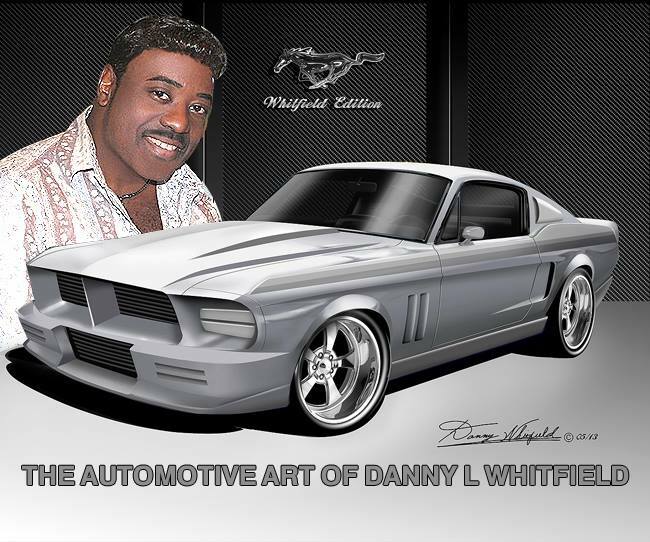 This entry was posted in Car Art - Automotive Art of Danny Whitfield and tagged #2013 mustang, 2013-2014 Ford Mustang boss 302, 2013-2014 Mustang Widebody Kit, Car Art - Automotive Art of Danny Whitfield. This entry was posted in Car Art - Automotive Art of Danny Whitfield and tagged 1967 Chevrolet Chevelle ss, Car Art - Automotive Art of Danny Whitfield.